Image above: The zoom tool of spatial levels and scale. In previous Spatialworlds postings I explored the concept of scale and discussed the idea of looking at scale like a zoom tool. That is, as 21st Century citizens we zoom in and out of the spatial levels as we think about geographical events, phenomena and processes. One minute we may be thinking at the spatial level of global, then regional, then national and then local (not necessarily in that order). We repeatedly zoom in and out as we try to make sense of our world in geographical terms. This has not always been the case in the past, with citizens being much more locally focussed without access to travel, education and media that allow a broader perception of scale. It can be argued that there is a difference in scale perception between rural and city dwellers, less developed and more developed countries and between isolated and less isolated places. Certainly food for thought as we consider world views on a range of issues. Basically the creation of a map at a particular scale is simply a snapshot of where we are thinking at the time - if thinking global we create a map of the world at the appropriate scale. 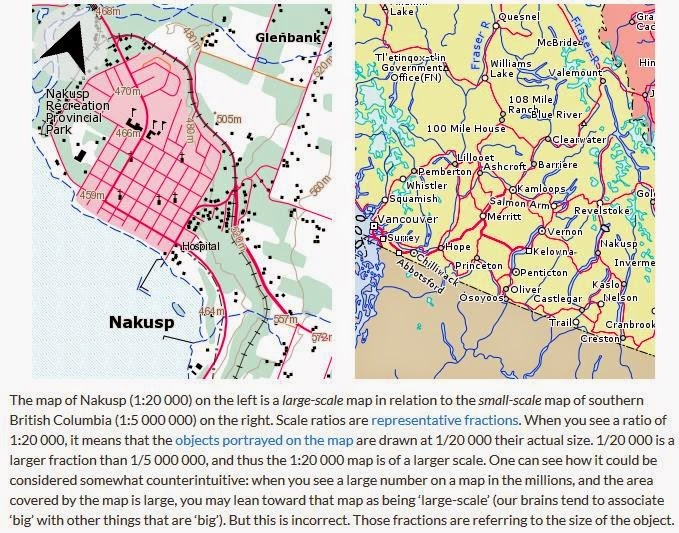 This posting gives a few ideas on practical ways to understand the concept of scale and delves into the terms small and large scale maps. To help demystify scale some teachers have suggested the use of different size Tupperware to demonstrate how one spatial level dovetails into another. 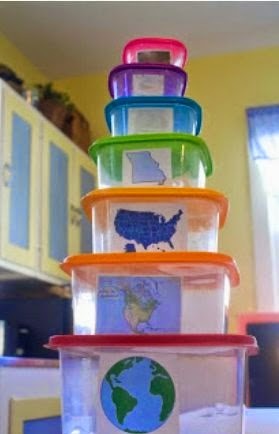 As shown in the image above, the teacher has placed cut-outs of world maps, national, regional and local inside each of the varied size Tupperware containers. 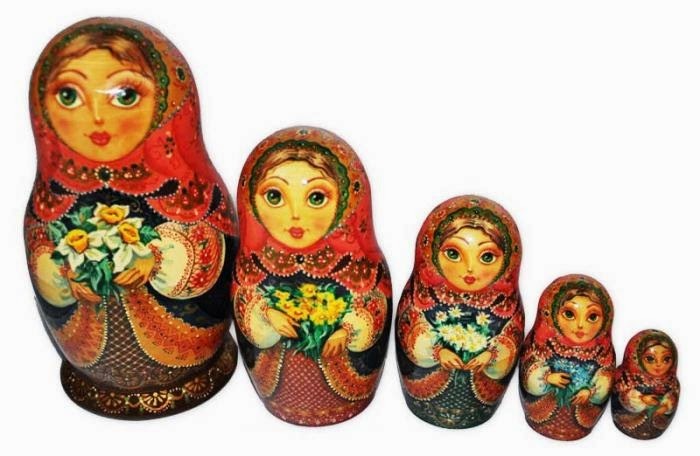 Another interesting way some teachers employ is the use of Babushka dolls to demonstrate the spatial levels of scale. After getting across the concept of spatial levels and zooming in and out we can move onto exploring the mathematical aspect of scale. A student friendly way to engage the concept of map scale and ratio is through the study of the scale of model trains/planes/boats. 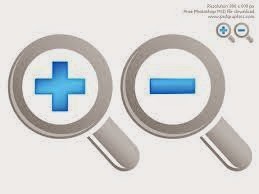 The 1:real life ratio is certainly a good way for students to relate to the concept of scale before trying to decipher a map ratio (also referred to as a Representative Fraction - RF) such as 1: 100 000. A point of scale which often causes consternation is the question of what is a small scale map versus a large scale map? To help with this it is best to just say that the smallest scale map is the globe (RF of 1: 40 million) - shows a large all of the world at little detail. Every map of a lesser ratio in number is called a large scale map - shows a smaller area of the earth in greater detail i.e. a 1:100 000 map is a smaller scale map that a 1:50 000 map. Just think 'globe small, 'globe small'!! ... and then work backwards from there to the largest scale maps of the local area.